I have been promising to publish this for a while, but am just now getting around to it. We love it. Enjoy! **for egg free version: use 1 ½ Tablespoons ground golden flax and 4 ½ Tablespoon warm water mixed together to replace the egg and egg white. 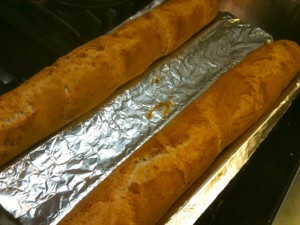 Oil rimmed baking sheet or French bread pan, or baguette pan. 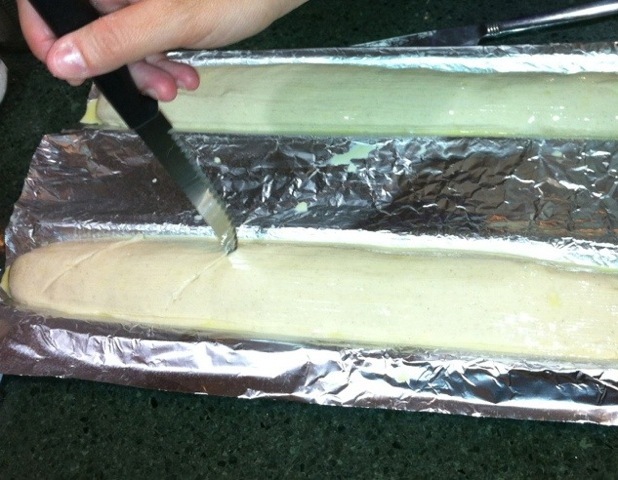 If using French or baguette pans, line indentations with foil or parchment paper and oil foil or paper. (This lining step is necessary or the dough will stick in holes of the specialty pans.) 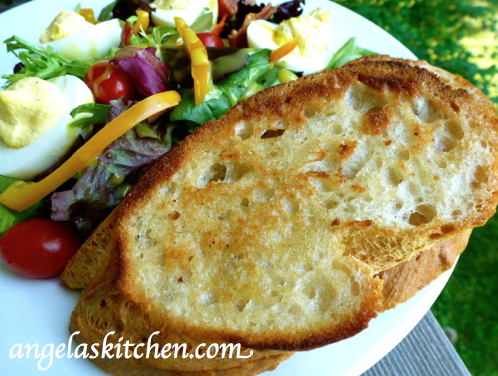 Using a baguette pan will give you the best results. Mix sugar and yeast in milk substitute. Set aside while mixing dry ingredients. Whisk potato starch, sorghum flour, tapioca starch, xanthan gum, and salt together in bowl of heavy duty mixer. Add yeast mixture, oil, eggs, and cider vinegar to mixer bowl. Using the paddle attachment of mixer beat on low until blended. Scrape down bowl then beat on high speed for three minutes. 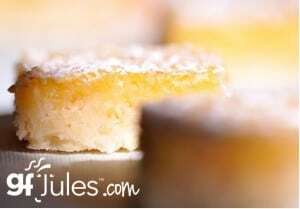 Divide dough in half or thirds, depending on size of loaves desired, on baking sheet. You can scoop the dough into the pan, or scoop the dough into a gallon sized zip close freezer bag. Snip the corner of the bag and use the bag to pipe the dough onto the pan (this is how I usually prepare this recipe). With wet hands smooth dough into logs 14 to 18 inches long. At this point you can brush with egg wash (I use the left over egg yolk whisked with 1 tablespoon of water), if desired. 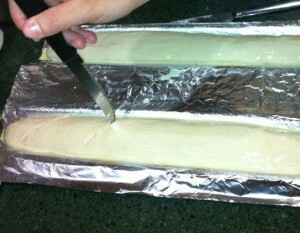 Make 4 to 5 diagonal slashes in the dough about ¼ inches deep. Allow to sit to rise for 10 minutes (15 minutes if using egg substitute). Place pan on a middle rack in a COLD oven. Take some ice and put it on an old baking pan you don’t mind warping, and put it in the oven (on the bottom rack) with the bread (on the rack next one up from the bottom one in the middle), to get steam in your oven which helps eliminate the weird hard top gluten free crusts can get sometimes. Set oven to 425 degrees and bake for 30 to 35 minutes for 2 loaves and 25 to 30 minutes for 3 loaves until nicely browned. The recipe calls for: 1 ¼ cup warm gluten and dairy free milk substitute of choice But this recipe is suppose to be gluten free. Also when do you add it to the mixures? I didn't see that part of the recipe. will any milk substitute work? Goat milk or almond milk. What about soy?